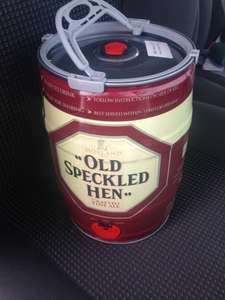 Old Speckled Hen is a delicately crafted beer with a rich, malty taste and is often enjoyed by those on the hunt for the less conventional things in life. Morrison's £16 for 20 pints in-store. 0.80p a pint! This is not 20 pints. It's 5 litres which is just under 9 pints. And this is the normal price. So to be clear. It's about £1.82 a pint and it comes in a stupid container not easy to drink cans or bottles. You may be surprised to know that the store is actually called "Morrisons"
I'm sure these are 5 litres. So only 8.8 pints. 5000ml ÷ 568ml (pint). Still good deal though. Great for a long weekend and pretty strong. Yes 5ltrs. You can get it straight from greene king too. Currently £15 in Tesco (although it tends to only be in larger stores). They also sometimes have similar kegs from Adnams and St Peters. Please provide calculation of 5l = 20 pints. I think the title should be changed, very misleading. You mean because it's factually incorrect? I wouldn't let a small thing like that worry you. This is lovely but I agree it's only five litres and being sold at the usual price. As such I had to vote cold. You mean because it's factually incorrect? I wouldn't let a small thing … You mean because it's factually incorrect? I wouldn't let a small thing like that worry you. But it does, I thought 5 of these at 20 pints each will see me through the weekend. are these in stock in the henley store? Change the title as its so misleading, They are 5 litre kegs just over 8 pints!! And it’s not even old. Just change the title, can't be difficult.